Posted July 24, 2017 in Book Reviews. In 1963 Joe Marohnic was teaching in Niagara Falls, Ontario when he and his wife Jennifer decided to get away from the pollution and bureaucracy in southern Ontario. After much searching they decided on a town on the edge of a wilderness park. Joe took advantage of the easy access to wilderness in Atikokan and became an avid canoeist and camper. He found there was a lot to like in Atikokan – the rail yard, clear northern skies, snowshoeing, and a river slowly winding its way through the town. Most importantly, the town was full of a variety of interesting people. It wasn’t just students who shared his passion and trudged up the hill to the telescope. Forty years ago my wife Marie and I followed Joe up the hill behind their house in Highland Park to look through his big telescope. He would point out double stars, distant galaxies, craters on the moon, planets, and other wonders of the universe. We saw the rings of Saturn and, like his students, we also expanded our universe. Joe taught grade school in Atikokan from 1964 to 1978 and then taught an inventive and highly successful alternate learning program at the Atikokan High School until his retirement in 1990. Most of his students were disadvantaged kids who caused trouble in class, and teachers were glad to see them go. Joe, on the other hand, calls them “my favourite kind of kid.” A collaboration between Joe and some of the students about their experiences, good and bad, resulted in the book “All I Can Give You Is Me”. Joe learned the craft of photography in Atikokan. He was fortunate in having one of his favorite photography locations – the railroad yard – located right in front of his house. 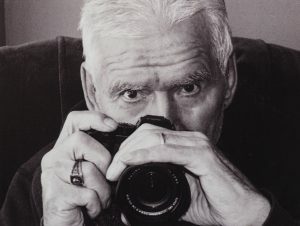 In addition to his own photography he has also taught photography and darkroom skills to many people in Atikokan. A book that I really love called “An Opinion in Black and White” is the compilation of photos from one class in 2004 at the Intergenerational Arts Centre in town. Joe is an 83 year old self-taught photographer who is still learning how to “photograph like himself.” He has had twenty-one solo exhibits in Canada and Europe, been awarded Ontario Arts Council grants and has published four books, including one about Croatia, the country his parents emigrated from and that he has travelled to many times. Joe now has medical problems and his lack of mobility limits his photography. He even stopped taking photos for a while but missed it so much that his wife Gabrielle convinced him to start again. The photos in his most recent book, ‘Portraits From My Armchair’, was primarily taken in his Thunder Bay living room adjacent to a large window that provides soft, directional light that is ideal for portraits. A few of the portraits were taken outside and for those he substituted his wheelchair for the armchair. He asked friends, family, neighbors and people he encountered in his daily activities if they would like to be photographed. For privacy reasons, he doesn’t identify the people in the portraits but he does have a short quotation from a respected photographer to go with each photo. The first one – “It is easy to make a picture of a stranger and call it a portrait. The difficulty lies in making a picture that makes a viewer care about a stranger” – best summarizes the strength of Joe’s photography. To accomplish this, his goal is to make a connection with the person. He wants the feeling to be like having coffee together but with a camera, rather than doughnuts, between them. Then he has a chance to catch the spirit of the person. Photography and astronomy give Joe hope and keep him active in body and in spirit. His enthusiasm is contagious. Through his teaching and his example he has helped many others realize that they also have enthusiasms that they should share with others.